This was the second time this year that the Town of Huntington pulled dogs from the Babylon shelter. King, an adoptable pit bull. East Northport, NY - August 22, 2018 - When alerted to the high adoption (and vacancy) rate at the Town of Huntington Animal Shelter early in his term as new Town Supervisor, Chad A. Lupinacci enthusiastically agreed with shelter management that the Town should begin to rescue dogs from overcrowded municipal shelters in neighboring towns. 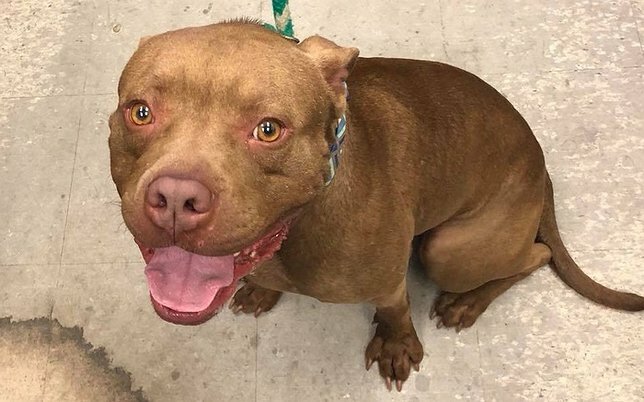 On July 31, the Town of Huntington Animal Shelter pulled three beautiful pit bulls from the Babylon Animal Shelter: “Tristan,” “Marble,” and “King.” This was the second time this year that the Town of Huntington pulled dogs from the Babylon shelter, the first time was in June, when the Town pulled the first three dogs. The Town of Huntington Animal Shelter has such a high adoption rate, it often has several vacancies in its 80 kennels, which prompted Animal Shelter Supervisor Jerry Mosca to suggest to new Town Supervisor Chad A. Lupinacci that the Town start a rescue program, taking dogs from overcrowded shelters in neighboring towns to help those towns avoid euthanizing dogs simple due to a lack of kennel space. Mosca said the Town’s shelter employees visited the Babylon shelter, which was filled to capacity, to test and assess suitable candidates for Huntington’s adoption program. They determined the three dogs chosen were “wonderful” candidates and had “great adoption potential.” The dogs would start in the Huntington Animal Shelter’s training programs the next day, with the goal of having them responsibly adopted as soon as possible, allowing shelter employees to return to the Babylon shelter (and others) and repeat the process. Once the dogs arrived at the Huntington Animal Shelter, they were put through a very intense assessment process so employees would be able to see every personality trait each dog possessed. The dogs were then worked into the shelter’s training programs and dog socialization play groups, so they were completely ready to find their forever homes when they were put up for adoption. Dogs are given time to settle in and become comfortable with Town staff to ensure they are adoptable. On August 10, ten days after the Babylon rescue, the Huntington Animal Shelter posted photos of Tristan, Marble and King on their Facebook page, which launched in late 2015, to let the public know they were ready for adoption. While the Town’s Animal Shelter is not the only shelter micro-chipping all adoptions and holding spay-neuter events, under Mosca’s direction, the Town of Huntington Animal Shelter has implemented initiatives that have helped drive permanent adoptions up and kept its kennels open for new adoptees. Starting as the interim shelter supervisor in 2010, Mosca began the practice of requiring all employees, including animal control officers, to start walking the dogs in their care. Until then, many of the dogs would sit in their kennels most of the day. Soon after becoming the permanent shelter supervisor in 2013, Mosca started a series of initiatives, starting with the move to a digital shelter management system in 2014, a recommendation of Michael Costa, a part-time shelter employee who became full-time and effectively serves as Mosca’s right hand. The benefit of a digital record system meant better tracking of repeat offenders, owner records, veterinary and vaccine records. The results were quicker actions, more effective enforcement, and soon after implementation, “bad” dog owners no longer owned dogs. In addition to the shelter’s Facebook page launch in 2015, the Town contracted with Aimee Sadler of Dogs Playing for Life to provide a three-day training seminar regarding dog play style and identifying animal aggression. Sadler is a nationally recognized trainer specializing in behavioral problems. This action led to the largest adjustment to the Town’s live release rate. Shelter employees were able to more correctly identify true animal aggression (versus simple posturing behavior) and learned how to work with unwanted behaviors, increasing adoptions by at least 10%. The adoption rate grew from approximately 85% to 95%. The Town implemented a dog socialization program in 2015. Animals that sit in kennels need to get out and play, so Dogs Playing for Life (DPFL) taught the staff how to run the socialization program, which includes regimented playgroups, outings, training sessions and more. Results showed dogs were happier, less stressed out and easier to adopt, reducing length of stay from approximately eight months to two months. In 2016, the Huntington Animal Shelter added dog agility training. Putting shelter dogs through agility courses helps some of the more intelligent dogs decompress, as these dogs are often more nervous in a shelter setting. All physically suitable dogs are put through the agility course, as shelter staff found that dogs were better able to focus on behavior training after being put to task through agility training. This also helped reduce the amount of time staff needed to spend with a dog before it was truly prepared for adoption. The Town of Huntington Animal Shelter is located at 106 Deposit Road in East Northport. Shelter hours are 8:00 AM to 6:00 PM Monday through Friday and 9:00 AM to 4:00 PM Saturday and Sunday. The shelter can be reached at (631) 754-8722 or animalshelter@huntingtonny.gov. The public can report lost or found animals on the shelter’s page on the Town’s website: http://www.huntingtonny.gov/animal-shelter. Subject: LongIsland.com - Your Name sent you Article details of "Lupinacci Greenlights Dog Rescues from Overcrowded Municipal Shelters"